It has been raining – no, pouring – in Lisbon for about the past week. It’s the kind of rain that comes down in sheets, pounding against roofs and windows and turning the whole city into a grey and blurry watercolor painting. It’s easy to find myself complaining about the rain, especially because I live in a big city and have to tramp through exactly 19 giant puddles between the bus stop and my work with an umbrella that is no match for the wind and “waterproof” boots that are just… not. But on the weekend, when I’m too lazy to leave the house and am just looking for any excuse to stay in my pajamas all day, drink tea, watch movies and have cake for breakfast, there’s really nothing better than watching and listening to the rain pouring outside. Now, let’s get serious about that “cake for breakfast” thing. You know the thing I’m talking about. This cake is adapted from a muffin recipe, and while I’m sure that it would make fantastic muffins, I really, really wanted cake for breakfast. I wanted this for many reasons, but mostly because it’s cake… for breakfast. Need I say more? This cake is only slightly sweet, but it’s rich and warm and satisfying. 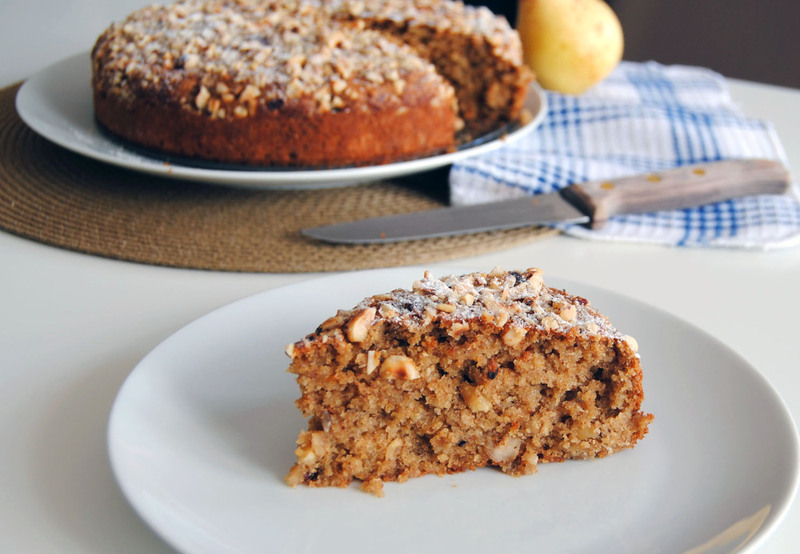 The grated pear keeps the cake moist while the hazelnuts add a rich nutty flavor and the perfect amount of crunch. It’s perfect with tea or coffee for breakfast, and just as perfect with vanilla ice cream for dessert. Preheat the oven to 425ºF/220ºC. Butter a 9-inch round cake pan (I used a springform pan). In a large bowl, mix together oats, flours, baking soda, baking powder, cinnamon, nutmeg, ginger, salt and about half of the chopped hazelnuts. Peel and core the pears, and grate them using the largest holes of a box grater. 3 medium pears should yield around 1 cup of grated pear. In another large bowl, whisk together sugar and melted butter until smooth. Mix in the buttermilk, eggs, vanilla and shredded pear. Add the flour mixture and mix gently until just incorporated – don’t overmix! 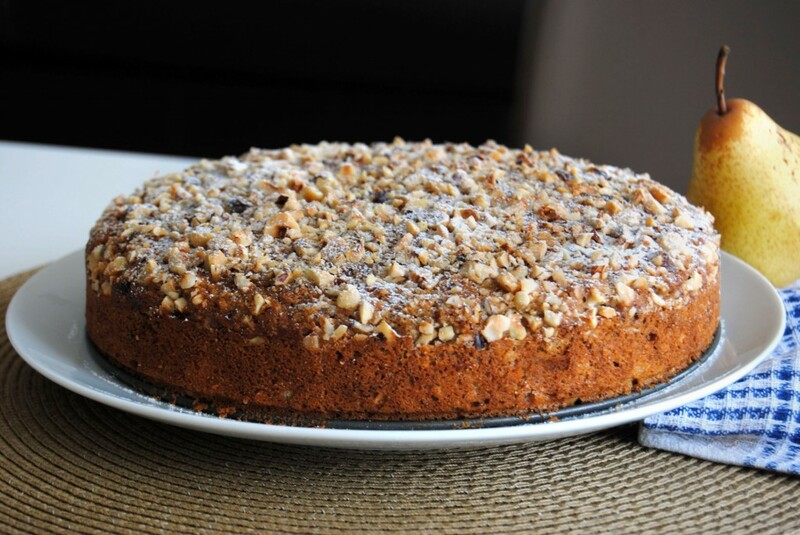 Pour the batter into your prepared cake pan and sprinkle the remaining hazelnuts over the top of the batter. Put the cake in the oven and immediately decrease the temperature to 375ºC/190ºC. Bake until the top is golden brown and a toothpick comes out clean (about 35 minutes). Remove from the oven and let cool for at least 10 minutes. Remove from the pan and serve warm or at room temperature. It looks fantastic! Undoubtedly much better than the cake Bill Cosby’s kids had for breakfast!